Wish more could be done for these poor animals but, hey, it takes a village! Whiners Are People Too! Let’s Help em! Petaluma Pete (the piano player) is actually John Maher. He and Brenda, his bride of 36 years, live over on 5th and C, just close enough for the honky-tonker to push his 800 lb piano to Western & Petaluma when it isn’t stored outside the Downtown Association office (Thanks, Marie!). essay help John fell in love with Petaluma 2 years ago after moving here from SoCal, and brings 35 years of advertising & promotion experience with him. 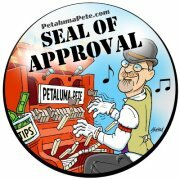 See his Kid’s Korner Petaluma video collection by clicking HERE.